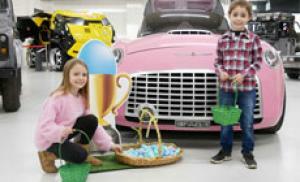 The Museum kick starts its Mini 60th celebrations with a host of themed family activities this Easter from 6 – 28 April. Visitors can enjoy family tours with a Mini mad mechanic character, follow a Mini Trail and make a Mini using air dry clay. Over the Easter Bank Holiday Weekend from 19 – 22 April children can enjoy a traditional Easter Egg hunt with a Mini twist - collect eggs around the Museum to claim your Mini Egg reward. The ‘Back to the drawing board’ Mini trail is also available daily and takes inspiration from Alec Issigonis, the designer of the Mini. Children can pick up a trail board and explore the Museum finding different pieces of a jigsaw to design a Mini - with the added incentive of a Mini reward sticker once completed.